So you head to the rental shop on the beach and see what this is all about and you decide that you want to give it a go. While the difficulty in starting SUP is fairly easy, there are some considerations to make that will help you make the most out of your first experience and this article will help get you on your way first paddling session and on your way to learn how to paddle board. The answer is, it’s the fastest growing water sport in the world and for good reason. There is relatively little gear you need, it can be done on virtually any body of water, and is accessible to a wide range of people. From complete novices, to experts, stand up has broad appeal. Combining elements of surfing and paddling, it appeals to people so much because it can provide a great workout, is recreational, and if you are competitive, there is the racing aspect to it as well. The first thing you should do when you decide to learn how to stand up paddle board is head into the local shop and inquires about lessons. This will help you accomplish a few things. First, it will put you in contact with someone that can show you the proper way to enter the water, how to begin paddling, standing up on the board, turning, and navigating. Can you figure this out on your own? Sure, but the learning curve will be much greater than if you have an expert there showing you how to do it. Second thing an instructor will provide is knowledge of the local bodies of water that are good for beginning paddling and be able to discuss points of entry, any hazards in the water to avoid, and where to exit. – In addition, developing a relationship with a shop will be good for the time when you are ready to buy your own board as they can make recommendations for you based on your body type, skill level, where you will be paddling, and what your paddling goals are. Items to consider are fitness, racing, recreation, river paddling, downwinders, or boards that are rigged out for fishing. Finally, a lot of shops arrange for tours which are a great way to network, make some paddling buddies, and have a good time in the process as that is what this is all about. If you forgot the lesson, you can still stand up paddle without much prior knowledge. The first thing you’ll need to do is to get familiar with the equipment necessary to get you paddling. 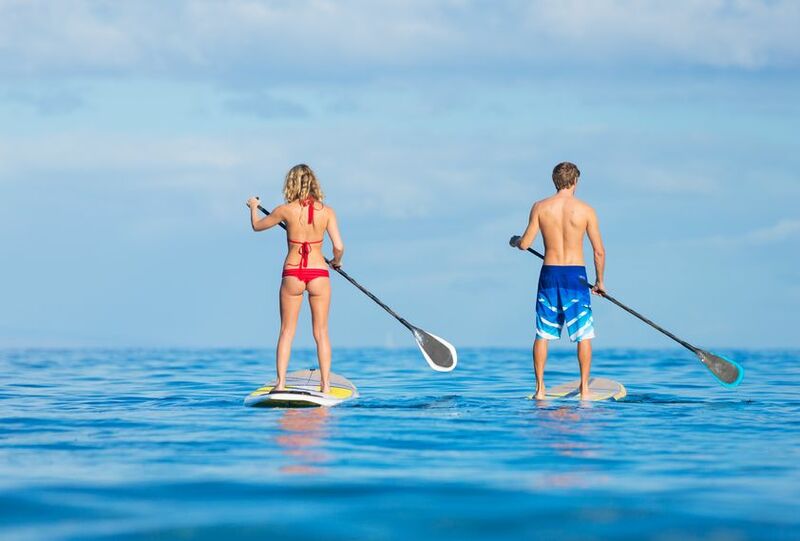 Stand Up Paddle Board: There are a lot of different boards out there for different types of paddling. Generally, a board is made from EPS foam core with layers of fiberglass and epoxy covering it. Most boards have a single fin or thruster setup where you have one large fin and two small fins adjacent to the single center fin. It’s much better to get a large board that is thick and wide to begin on. This won’t offer much in terms of speed and maneuverability, but will be extremely stable and as you are starting out, you’ll learn more and have more fun by staying on the board than falling off it. As you get more experience, you can get smaller boards that will offer you more flexibility. Generally, most shops will set you up for the first time on an all-around board that will be fairly long to provide good tracking, wide so that you will have good stability, and fairly thick so that it will float you well. In addition, many shops will get you on soft-tops. These boards have a foam layer on the deck and bottom of the board so that if you fall, the impact will be lessened rather than hitting the hard shell of an epoxy or fiberglass board. Paddle: There are several types of paddles available as well. Aluminum, wood, and carbon fiber are the most typical. The best paddles for durability, weight, and performance are carbon fiber paddles. They also come in fixed paddles that are cut specifically to a person’s requirements and adjustable that you can adjust to fit whoever is paddling. To start, an adjustable paddle is recommended. You can customize it to your height and can play around with different sizes until you find what best works for you. As a general rule, you should set the paddle to be around 6 to 10 inches above the height of the paddler using it. If you are paddling in flat water, tend to the longer side. On the other hand, if you are in surf, (not advisable for your first paddle session) tend to the shorter side. Leash: Leashes will keep the board attached to you with a Velcro strap that goes around your ankle and is attached to the board on the other end. Basically, there are two types of leashes, a straight leash and coiled leash. Typically, a straight leash should be used in ocean paddling. The longer leash will allow some slack in it so that if you fall off and a wave catches the board, it will remain attached to you, but the slack will keep it far enough away so the board doesn’t slingshot back and hit you. As a general rule, a straight leash should be about the same size or just a bit shorter than the board. This should be enough to give space to keep you safe, but not so much that it becomes a hazard to other paddlers or surfers. Coiled leashes are great for flat water as they coiled, so they are shorter than a straight leash and won’t create so much drag in the water. In addition, when you are on land, you won’t be tripping over them so much either. While they are great for flat water, they aren’t recommended when you are paddling waves. In flat water, you are likely just to fall off your board and it should remain fairly close to you. In waves, the board can be quickly taken off by the wave and when the coil reaches the end of the slack, it can slingshot back very quickly and become dangerous. Therefore, keep the coiled leashes only for flat water paddling. Traction Pad: Most boards will already come equipped with a pad. These are soft layers of EVA foam on the top of the board that are grooved in order to provide both traction and comfort as you are standing on the board. Personal Floatation Device: The coast guard has classified stand up paddle boards as a vessel. What this means is that when you are outside surf zones, swim zones, or bathing areas, you will be required to carry a PFD with you, a whistle, and if you are paddling after dark, a flashlight.Wetsuit: If you are paddling colder waters, a wetsuit is a must. Ultimately you will fall in the water at some point and you’ll want to make sure that you’re protected from chilly waters by having a proper wetsuit. Check with the local shops to see what your local water temps are and what wetsuit thickness is appropriate for those temperatures. Wetsuit: If you are paddling colder waters, a wetsuit is a must. Ultimately you will fall in the water at some point and you’ll want to make sure that you’re protected from chilly waters by having a proper wetsuit. Check with the local shops to see what your local water temps are and what wetsuit thickness is appropriate for those temperatures. Most boards these days have a center handle in the middle of the board. Simply lift the board by its handle and go. However, if for some reason, your board doesn’t have a handle, the easiest thing to do is a shoulder carry. Lift the board by the tail with the nose on the ground. Walk to the center of the board and shift the weight of it to balance on your head and then shift it to balance on your shoulder. When putting the board down, just do the same process in reverse. As noted in the equipment section, for your first time, you should have a long board that is wide. 11’ or longer and 30” wide or wider is a good starting board. The most common error people make when they start out and don’t have success is because they are on a board too small for them, have trouble balancing, and end up in the water constantly. Always go for a bigger and wider board when you start and it will make it much easier to learn how to paddle board. For a first time paddling, you should always start out in flat water that is calm. Again, safety and learning the ropes, will increase your fun and you’ll learn much more quickly. To start, make sure if you aren’t wearing your PFD, that it is attached to the board. Many boards have bungee cord mounts with cords so that you can put it in there. Next, make sure that one end of the leash is attached to the board and you Velcro the cuffed end to your ankle. 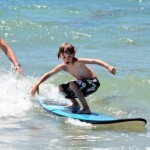 Grab you board and paddle and walk the board to about knee depth in the water. From this point, it is easiest to climb on top of the board, but don’t stand yet. Balancing the board is much easier once it starts moving. So rather than trying to stand right away, it’s best to stay on your knees and start paddling with your paddle to get your board moving. Once you gain a little speed, stand up, get centered on the board, and keep your feet about shoulder-width apart with knees slightly bent. You’re now up on the board and moving! Once you’re standing up, in order to keep moving, you’ll need to paddle. So here’s a few strokes to get you around. The most common stroke to learn is a forward stroke. Basically, you want to use your paddle as a lever. To do this, you’ll place your top hand on the handle to drive the lever and your lower hand will become the fulcrum point. To do this efficiently, remember to keep your bottom arm straight, pull your top arm toward your body, then rotate your top shoulder forward and extend your reach. Insert the paddle blade fully into the water and pull the paddle. To keep straight, rotate the side you are paddling on. Now that you are going forward, you’ll need to turn. To do so, you can use a forward or reverse sweep stroke. To do a forward sweep, place the paddle in the water on one side and turn your torso to the opposite side. Keep a lower stance and pull the paddle towards the tail while turning your torso more in the opposite direction. This will begin to make the board shift quickly to the side you’re leaning to. To do a reverse sweep stroke, place the paddle in the water towards the tail and pull towards the nose of the board and twist your torso to the same side as the paddle. Bend your knees and this will spin the board in the direction you’re paddle is on. Well now that you’ve learned how to paddle board, you are probably addicted and there is no turning back. Other than joining a 12 step program, you’ll likely be heading down to the local shop or scouring the internet for your own gear and be hitting the water every chance you get! However, there are much worse things to be addicting to. Paddling is a great sport for exercise, hanging out with the family by taking kids on the boards or paddling with you, getting competitive by racing, taking the dog out on a paddle, fishing off your board, or just cruising the lakes and enjoying the scenery and glide.